Cattleyas are famous for their wonderful fragrances, which are one of their delightful trademarks. When you ask someone which of the Cattleya species has the strongest fragrance, most people will tell you Cattleya dowiana, which has such an intense and distinctive fragrance that you can even identify its hybrids by the similarity of their scent. Twenty years ago, I would have selected C. dowiana myself for the prize for odor but, when I acquired some plants of Cattleya iricolor a few years ago, all that changed. The grand prize for the strongest fragrance in the realm of the cattleyas goes indisputably to C. iricolor. As just a green plant, C. iricolor looks like any other cattleya you might see on a bench in someone’s green-house. It has an 8- to 9-inch- (20- to 23-cm-) tall Cattleya-like pseudobulb with about a 12-inch- (30-cm-) long single leaf at the top. The leaf is somewhat longer in proportion to the size of the pseudobulb than other Cattleya species, but except for this slight difference, it looks just like a normal everyday cattleya. You could easily pass it by unnoticed on your walk through the greenhouse. When the plant flowers, however, a whole new world emerges. Six or so spidery 3-inch (7.5-cm) flowers will fill your greenhouse with an intense fragrance that may even perfume your house as well if it is attached to the greenhouse — as mine is. The odor is so strong it may find its way to your neighbor’s front door. Once in flower, it is impossible to ignore C. iricolor. The flowers of C. iricolor are, without doubt, unusual looking for a cattleya. They are strange enough that you might think they belong in another genus. The flowers have a lip that comes to a sharp point like Cattleya aurantiaca, and some botanists may give it a new name one of these days, as they have with C. aurantiaca, once they examine its genetic makeup. 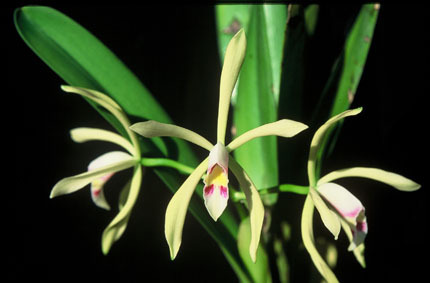 At the least, we can consider C. iricolor unique among the Cattleya species. The flowers of C. iricolor, unlike the large-flowered cattleyas, are all very much alike. The color of the sepals and petals varies only slightly from a pale straw yellow to a creamy white. The lip has a bright yellow throat with purple on the inside of the lobes and purple lines or bars in front of the throat. The V-shaped end of the lip is an off-white color, and the column is relatively short in length and colored purple on the underside. The petals are as narrow as the sepals, which is an uncommon trait in cattleyas. There are supposed to be alba forms of C. iricolor, but the ones I have seen are a creamy white and require a strong imagination to fit the descriptive term “alba.” The flowers last in bloom only about two and a half weeks, which may account for the strong fragrance, as it has to attract its pollinators as soon as possible before the flower dies. Cattleya iricolor sends out a new growth in the late autumn in the United States and produces a new pseudobulb during the winter months. As the pseudobulb matures, the flower spike emerges from the sheath and the flowers open in late February or March. Cattleya iricolor is an easy plant to grow and seems to adjust well to normal Cattleya greenhouse temperatures of 58 to 60 F (14 to 16 C) at night and 85 F (29 C) during the day. It needs lots of sun, moving air and normal greenhouse humidity and grows well in clay pots with a variety of standard cattleya mixes. I have found it to be a free-flowering plant that never fails to produce at least six flowers on a spike. If grown really well, C. iricolor can produce up to 10 flowers on a spike. Cattleya iricolor grows naturally in Ecuador and Peru where it is found at relatively high elevations around 3,000 to 4,000 feet (915 to 1,220 m) near the tops of tall trees. 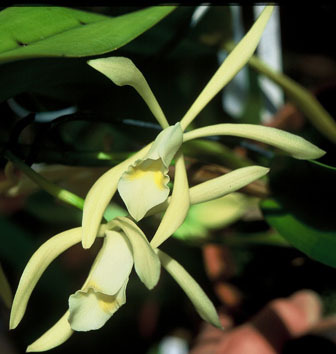 Cattleya iricolor’s small size and spidery-shaped flowers did not make it very attractive for breeding and only one hybrid was recorded before it was rediscovered in 1962. That single hybrid was made by Veitch in 1892 with Cattleya mossiae and was called Cattleya Philo. The cross is unknown in cultivation today, but it is so intriguing to see what nature could come up with using such diverse flowers as C. iricolor and C. mossiae, that I remade the cross this spring when the two parents were in flower and hopefully in seven years we will all know the answer. It seems amazing that a plant with such a powerful fragrance could go undetected in the jungle for the better part of a century during the heyday in the discovery of the Cattleya species. A few hundred plants of this species in flower in the jungle could give a distinct aroma to a whole mountain valley in South America. Perhaps the plant hunters spent too much time using their eyes instead of their noses to find plants or perhaps they just visited C. iricolor areas during the growing season. One thing is certain today, however, and that is if you have a Cattleya iricolor, it will tell you loud and clear when it is in bloom and you will not even have to tell your neighbors. They will have already noted its presence.